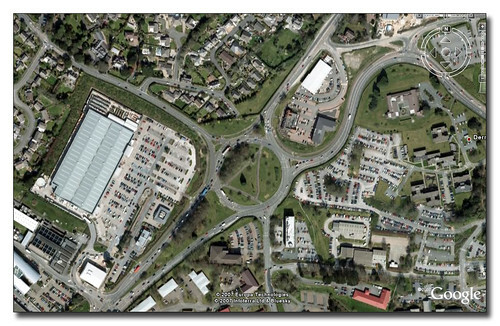 The biggest change is the new B & Q store development to the left of the roundabout. The large DIY store and the smaller KFC produce a lot of traffic as the large car park is well used. The other noticeable change is just to the North of the roundabout where the open field now contains the Jack Rabbit Pub and hotel block, and a large Mercedes Dealership. 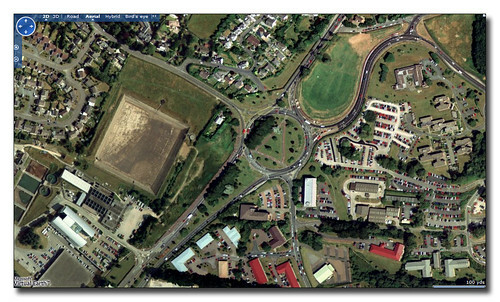 The latest Google Earth image and at first its hard to see if anything has changed that much. 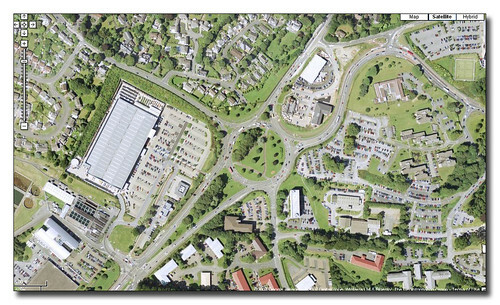 The two changes I have noticed are the new white block by the road entrance to the B&Q site bottom left which is a brand new M&S food store which is proving very popular and resulting in very heavy traffic in this area at the moment. The other change is at the extreme top right of the image where you can see more building work on a few buildings backing onto the airport site. It may seem that there is little scope for much more development in this area but more development is indeed planned! The Norwich Union building by the roundabout is being extended and there are plans for the hospital land to the top right of the roundabout which could eventually lead to a multistorey car park or more building on this part of the site. The traffic certainly isnt going to get any lighter anytime soon!